M A R I A H ! Yes, Mariah Carey is back with some new music and I'm so excited about it. After getting married to Nick Cannon, popping out her two beautiful twins - Monroe and Moroccan AKA 'dem babies' too cute, Mariah is back! Bigger and better. 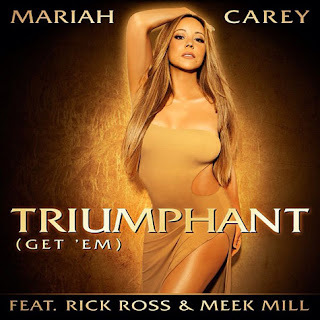 This time, Mariah featured two of MMG's heavyweights - Rick Ross and Meek Mill. The new hot track was produced by Mariah's long time friends Jermaine Dupri and Bryan Cox and is an 'uplifting' track as well. 'Triumphant (Get 'Em)' will be available for download on iTunes on the 7th August of this year! Listen to Mariah's new uplifting track/anthem below!